For many Linux users one area where Linux needs some improvement is money management. Yes there is the very powerful GnuCash (check out GnuCash in my article "GnuCash: Open source Accounting/Financing goodness"). But many users find GnuCash to be too much power for what they need. There is also the slick KMyMoney, but that depends upon KDE. So what do the non-power, non-KDE users have? One option is HomeBank. 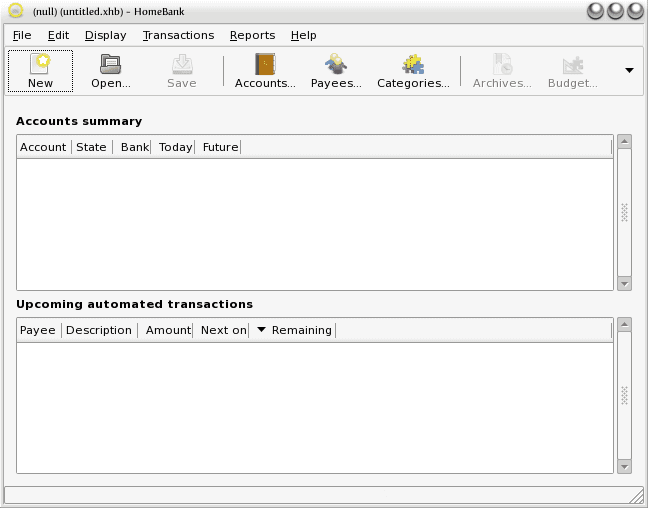 HomeBank is a free, open source personal accounting software - with the focus on PERSONAL. So with HomeBank you don't have to worry so much about the complexities of dealing with a double-entry accounting package. Instead, you will find a pleasant, easy-to-use piece of software that will server as a painless interface between you and your checking/savings accounts. 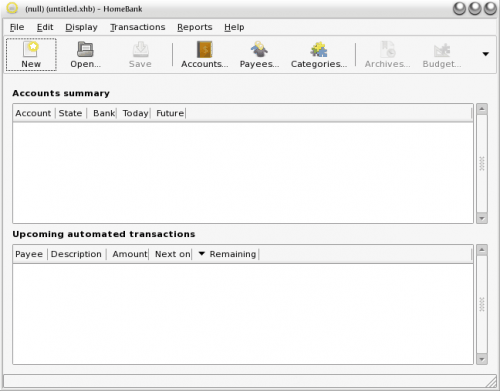 In this article I will show you how to install HomeBank, set up accounts, and use the software. Import from CSV, QIF, and OFX (although the import filter is VERY finicky). Works on GNU/Linux, FreeBSD, Microsoft Windows, MacOSX, Nokia N*** and Amiga. Search for "homebank" (no quotes). Mark the results for installation. That's it! You should now find the HomeBank menu entry in the Applications > Office menu (or just under Office if you are in KDE). When you first open up HomeBank you would think a "first run" wizard would start. That is not the case. Instead you will be greeted with a home screen containing no accounts (see Figure 1). Fill out all necessary information for your account. Your new account will now show up in the main window. Payee: Is who the transaction actually goes to (a retail store, restaurant, utility, etc). Category: Is what the transaction is related to. 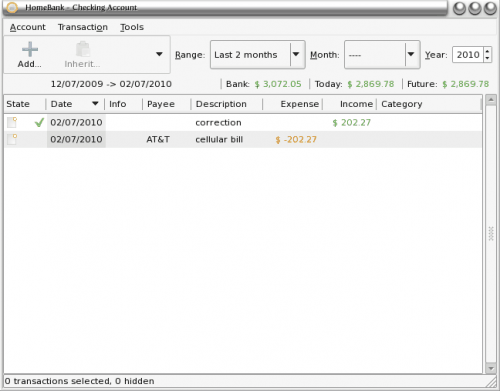 These can be debits or credits (such as Income or expenses). Enter a name for either the Payee or Category. In case of Category check the "Income" check box if it is an income category. Click the Add button to add the new item. When you are back at the home window, and you have your accounts listed, you can double click on the account you want to use for a transaction. When you do this the account register will open. In that register (see Figure 2) you can see how simple the interface is. From this interface you can add a new entry (by clicking the Add button), you can filter the entries in the registry, you can inherit a transaction, you can validate/invalidate a transaction, and you can see a running total of the account. If you are looking for an accounting software that is targeted more for users and not accountants or businesses, HomeBank is the software for you. Not only can you keep a running record of your expenses, but you can see your yearly budget at a glance to see your personal spending trends. It’s been about six months but the last time I tried HomeBank it could not split a transaction. So if you shopped at a department store and purchased items in different categories, there was no way to separate them. This inability renders HomeBank useless for budgeting. A much better alternative is Money Manager Ex. 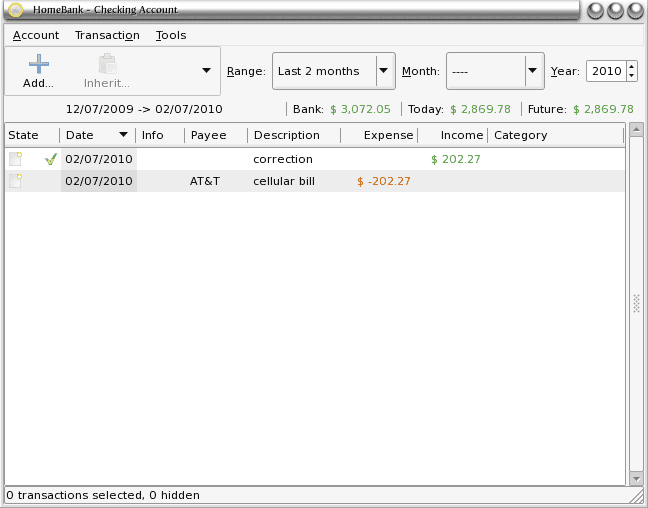 Money Manager does allow transaction splitting and is a far better tool. ‘But that depends on KDE’ misleads your readers. It reinforces the perception that applications built on the KDE platform are not useful outside the Plasma desktop. KMyMoney is widely used on other desktops and GnuCash and HomeBank used on the Plasma desktop. I love Linux but I dont think Linux is the best for homebank. I just tried setting up HomeBank after trying to use GnuCash (waaay overkill; I am not a stock market day trader nor do I run my own small business). So I set up a checking account and entered in data from one of my bank statements: the starting balance, eleven checks, one ATM withdrawal, and two wage deposits. And the result is: the final balance provided by HomeBank doesn’t match my bank statement! Not. even. close. It is different than the starting balance; it just has no connection with the data input nor reality. So it is simpler than GnuCash; it just can’t subtract or add. And there is no explicit Income category, just Payees. But to quote the (online) help: “The payee identify people you give money to, as like as those you receive money from.” So there’s that. What ever ‘that’ means. Plus, there is no register-style interface to show the change of your account blance with each line entry; just the entries and a sum total in the upper right corner of the page (which in my case was the incorrect amount). The entry stuff is probably my fault, but not having a register style interface is really mind boggling and a deal breaker; what do French cheque books look like? I had hopes for HomeBank, but I’ll have to keep looking. I really didn’t think it was going to be this hard to find a simple personal finance package for Linux. Read my comment on Money Manager Ex. It’s a far better program than HomeBank. I’ve been using it for about six months with no problems. As I commented earlier, HomeBank cannot split a transaction. You might get it to balance your checkbook but it’s useless for budgeting. LOL! I just downloaded and started using mmex 0.9.4.2 in Ubuntu! I have run into a slight existing bug: when using the MM/DD/YYYY date format when there is more than one page of transactions, the day and months get flipped when the transaction is saved. I filed a (forth) comment on the open bug report on SourceForge, but this still appears to be the exact program I’ve been looking for. It looks like Homebank can now split transactoins.